Michelle Valberg, The Canadian Geographic Photographer in Residence and frequent Ocean Light II guest, has a new project. A Canadian Geographic Colouring Book featuring a beautiful Khutzeymateen Grizzly on the cover. Look for it on magazine stands on May 8. Ocean Light II Adventures has an Instagram account! Slowly but surely we are getting on board with social media. Follow us on Instagram and look out for posts of snaps taken on the trips. Jenny Stevens, a long time client and photographer has had her grizzly picture from the Khutzeymateen minted on a Canadian Coin. It is available now and looks great. Congratulations Jenny. The BC Election is just around the corner, May 9! NOW is when we need as much support as possible. While Ocean Light II Adventures does not have a Facebook page we do support organizations that have been working really hard for years to End the Hunt. A couple of social media campaigns that are out there: Stop The Grizzly Killing and Voters who Care. Lush Cosmetics is in the Great Bear Rainforest right now with Ocean Light II’s former grizzly bear guide, Charlie Russell, making a documentary on stopping the hunt. Look out for the finished show in the weeks ahead! John Marriot, one of Ocean Light II’s photo leaders, has done a documentary web series called Exposed, a no-holds-barred look at his most favourite areas and subjects. Google it! They are well done and worth watching. Our 2019 is approaching very quickly. We are almost 100% fully booked; just looking for 1 more passenger to join our Gwaii Haanas Mothership trip, July 14-21, 2019. All the other trips: Khutzeymateen Grizzly Bears, Gwaii Haanas, Marine Mammal Explorer and Great Bear Rainforest Explorer are filled to capacity and we’re excited about getting back on the water. The Ocean Light II has been in a heated shed since early December and is getting a major facelift!!! It has been a huge project which is nearing completion. Everything- both masts, all rigging, rails, window trims, and hardware had to be taken off the boat to prepare for the sanding and painting. The hull is complete now, with 3 coats of primer and 3 coats of top coat paint looking incredibly shiny! The deck final coats were sprayed yesterday and look amazing. Starting next week, Chris, myself and a friend will move aboard to begin putting it all back together. We need to finish the woodwork, paint the non-skid deck panels and then re-caulk everything that we took off months ago. Here are some photos of the project to date. The Ocean Light II is 48 years old now but looks brand new!!! Stay tuned for the final photo once Ocean Light II is re-rigged and ready for the 2019 season. Our 2017 season is fast approaching and we are excited about all that lies ahead. Our trips are almost fully booked with just a few single spots left on a couple of Khutzeymateen trips (contact Jenn if you want to join). All the rest of the Khutzeymateen, Mothership Kayaking, Gwaii Haanas, Marine Mammal and Great Bear Rainforest trips are full and we are looking forward to meeting lots of new folks this year but also to see old friends. The winter has been busy for Ocean Light II Adventures. Jenn and Chris were working part time on the boat in the shipyard on a repair that took longer than expected. Happy to say that all is fixed and upgraded now and the Ocean Light II has a new main engine and lots of little upgrades for the 2017 season. The boat is back at the dock in Gibsons where we will continue to do maintenance in preparing her for the busy summer. We set sail on May 2 with our first trip starting out of Prince Rupert on May 12. We are going to start our season in the Khutzeymateen Grizzly Sanctuary where the bears are fully protected. Other bears in the province of BC are not so lucky. The BC Trophy Hunt is scheduled to open earlier than normal on April 1. BC is having a provincial election in May and with 4/5 British Columbians opposed to the Trophy Hunt. We are making an extra huge effort to convince the government to Stop the Hunt. Visit Pacific Wild to learn more about how you can help. Keep checking back here for updated news about our trips, our company and our beautiful coast. The Ocean Light II is now running the fall season of trips in the Great Bear Rainforest. Our new crew of Tom M., Luise, and Aiden have just finished up the first two trips. They are on a high from seeing Spirit Bears, Grizzlies, Wolves, Humpback Whales, Fin Whales, Orcas and a whole array of smaller wildlife and birds. Chris and I will be doing the next 3 weeks of trips and we are super excited about what we will be experiencing in the days ahead. Sailing again across Hecate Strait, this time in NW 20 knot winds. Another beautiful day on the ocean, it’s a sunny day and as we near the mainland coast we see humpback and fin whale blows in all directions. We’re making our way to Northern Vancouver Island for our Marine Mammal trips. Yesterday we finished 5 spectacular weeks in Gwaii Haanas. Some highlights include hiking through the alpine bog, swimming in waterfalls and lakes, catching lingcod and halibut, kayaking in quiet anchorages, sealions, seals and whales, standing totems in the fog, intertidal gardens and forest walks. A special treat was a pod of Risso’s dolphins swimming around our anchorage for hours one evening and waking to find them still there in the morning. Also an incredibly close sighting of an Ocean Sunfish (mola mola), which we have seen many times in the last few years because of warmer seawater, but this time we could actually make out the entire body shape and size! We had 3 family groups in Gwaii Haanas and 1 big family group on our first Marine Mammal trip. It is a delight to have 3 generations of a family on board together and we had lots of fun on those trips. Our Marine Mammal trips blew us away once again! The quantity and quality of Marine Mammal viewing and photography is unsurpassed. The Northern Vancouver Island area’s richness most definitely attracts animals and birds in huge numbers and the days are full from dawn to dusk. Once again the weather in August does not disappoint. We had some foggy mornings but as the fog burned off, we were treated to stunning land and seascapes. Canada Day and we are Mothership Kayaking in spectacular Gwaii Haanas National Park. We offer just one fully guided Mothership Kayaking trip each year and our 2016 trip is delivering everything we could hope for: opportunities to paddle into the ancient Haida villages, kayaking at low tide over incredibly colourful intertidal gardens, freedom to paddle further and into more remote areas and the perfect daily balance of kayaking, sailboat travel and land and cultural exploration. I think we have turned another group of keen kayakers into Mothership enthusiasts. They see the beauty of the Mothership, with the thrill of daily paddles in an exotic locations and all the comforts of home. I am writing this as we sail across Hecate Strait in SE 20 knot winds. The sails are full, the Sooty Shearwaters are gliding over the surface of the water and the seas are calm enough that I can be down below working on my computer. It’s a beautiful day and I feel a sense of relief and accomplishment. A couple of days ago we finished our Khutzeymateen season. Our trips began on May 12 and we had 40 days of incredibly fulfilling and exhilarating grizzly bear viewing. Again, as seems to be the norm now, it was a very early spring on the north coast. The flowers (a good indicator of seasonal progression) were already in bloom on our first trip and the grass was quite tall and luscious. But…..the bears were out and the viewing was great. Days were full from morning till night with activity. This year we did not see any cubs of the year, but at least 3 female bears that mated in 2015 were also missing. We are excited to see them emerge with 1 year old cubs in 2107. All of our trips were fully booked and I was getting enquiries for future trips the whole time we were there. We had a 35% return rate so we had lots of great trips with friends. Tom E., who started our Khutzeymateen program back in 1987 and has been the champion bear guide ever since, was in the Khutz for his last season guiding with Ocean Light II Adventures. He will be sorely missed. He deserves special credit for the role he has played in introducing the Khutzeymateen grizzlies to hundreds of people over the years. With his gentle guiding style and unswerving passion for the bears he has helped create more bear lovers and advocates for their preservation than anyone. How do I thank him enough for more than a quarter century of dedicated work? I’m not really sure. I just know his efforts will always be remembered and appreciated. I only hope the rest of us at Ocean Light II Adventures can carry on his legacy. It will be a tough act to follow. Spring is officially here on the West Coast of BC. Beautiful flowers are blooming, trees are sprouting their leaves and the sun is shining down more and more often. Springtime is also a time to get the Ocean Light II prepared for the upcoming season and we are doing just that. Chris and I are busy doing boat maintenance, buying food and supplies and gearing up for another great season on the coast. We have lots to be thankful for, an almost completely full season ahead (more on that later…), the beautiful and comfortable Ocean Light II, a brand new 19 Hurricane Inflatable boat, our health, our families and the anticipation of an exhilarating few months ahead! Ocean Light II is in the news right now. Canadian Geographic Magazine’s April issue has a piece on the Khutzeymateen. It is well done and highlights Ocean Light II Adventures very nicely. Congratulations to our past guests, who contributed photos for the article and had them published. There is also a piece in the spring issue of Photo News by Michelle Valberg, which is excellent and is accompanied by wonderful photos. Congratulations also to Jenny Stevens whose shot of a Khutzeymateen Grizzly has been selected to be minted on a Canadian Coin. Can’t wait to see it! We have just recently received news from the BC Cetacean Sightings Network that we were one of the top observers of marine mammals on the BC Coast in 2015! For the past 2 years we have diligently kept a log of all the marine mammals that we see while out on our trips. The info in the log has now been analyzed and will be used for conservation, research and education projects on the coast. Of course many of the sighting are on our Marine Mammal trips but we also often see marine wildlife on all of our other trips. The personalized sightings map that we were given covers a large area of the coast. We look forward to having more sightings in 2016. All of the 2016 trips are booked, except for a few places on our final Marine Mammal Explorer trip, August 20-27, 2016. The Marine Mammal trip is amazing, the variety of life that we see is unparalleled. Each and everyday is filled with marine and land mammals, birds and breathtaking vistas. It is an easy trip to get to with multiple daily flights out of Vancouver to Port Hardy on Vancouver Island or by ferry from the Lower Mainland and a nice drive up the island. Why not finish off the summer with a week aboard the Ocean Light II? We would love to see you. Send me an email if you’re interested. Check back here in mid May, I’ll update you on all the great things we experienced on our trip up the coast. I hope everyone’s year will be filled with new discoveries, health, happiness and exciting adventures. Ocean Light II Adventures is eagerly looking forward to the start of our season in May. The Ocean Light II is safely tied to the dock in Gibsons, BC and we spend a few days each week doing upgrades and maintenance and prepping the boat for the arrival of our 2016 guests. 2015 was a very successful year for us, we were booked to 95% capacity and 1/3 of our guests were repeats, some coming back for their 16th trip! As usual we saw some amazing sights, witnessed incredible wildlife shows and all of our guests went home fully satiated. The Khutzeymateen and the bears that inhabit it were as awe-inspiring as ever. In the Khutzeymateen one can safely see grizzlies in a stunningly wild setting and experience their behaviours in a very intimate way, it is a must for wildlife lovers. Each year we start our Gwaii Haanas season with a fully guided Mothership Kayaking trip in Gwaii Haanas in conjunction with Butterfly Tours, a long standing Gwaii Haanas kayak company. This trip provides the perfect balance of time to explore the islands from water level in kayaks and the comfort and range of the Ocean Light II. All of our spectacular Gwaii Haanas week-long adventures offer the very best in outer coastal diversity. Each and every day is filled with incredible scenery, rich flora and fauna and the solitude of these remote islands. The Marine Mammal trips in August continue to surprise and thrill us each year. The more time we spend on the northern tip of Vancouver Island, the more incredible wildlife we are able to observe and photograph. In the Great Bear Rainforest for 2015 we changed our itineraries so that we started and finished many of our trips out of Kitimat, BC. We all agreed it was a successful change. We were able to explore new areas which we feel have great potential and at the same time we feel we have greater access to the iconic Great Bear Rainforest species: the Spirit Bear, the Grizzly, the Humpback Whale and the Wolf. Congratulations to all our guests who won awards for their stunning wildlife photos. The company and guides take pride in providing the best opportunities for wildlife viewing. 2016 is really shaping up nicely as well. There are only 8 spots left to fill over the entire 5 month operating season. Contact me if you want to book on one of our spectacular adventures for this upcoming season! Our crew are all returning for 2016, Jenn, Chris, Tom and Sarah, Luise and Tom M. and we all look forward to sharing memorable times with you. Check back here often……it’s my New Year’s resolution to update the News page more frequently. 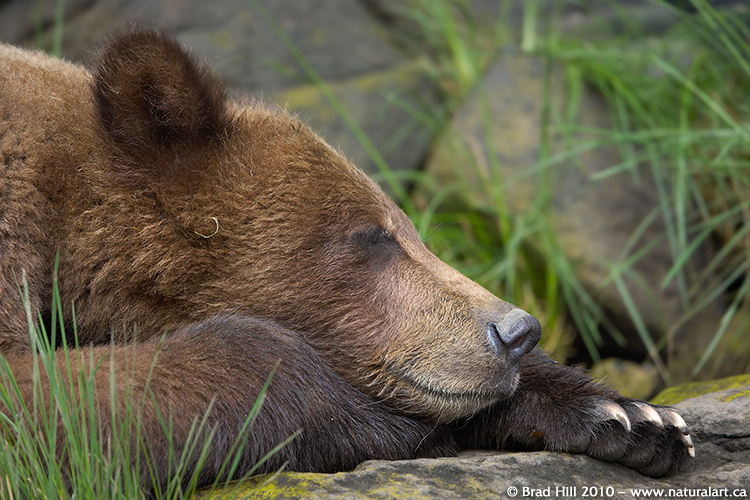 8 June 2015 - Grizzlies of the Khutzeymateen Update! Well, we're half way through our 2015 Grizzlies of the Khutzeymateen season and it has been really amazing. It's been a really early spring on the north coast and the estuary is in full bloom with flowers and tall grasses. The weather has been phenomenal (maybe not for photographers) with lots of sun and we have had dry days from the very beginning. It is overcast today but clear skies are coming again. The bears have been performing like usual - which means "absolutely amazing"! To this point many bears have been using the estuary at the top of the inlet and we've observed (and photographed) lots of mating behaviour further out on the Khutzeymateen Inlet. We have seen things that we have never seen before over the decades we've visited the Khutzeymateen - including new big male bears appearing to mate and then leaving, males fighting over females, females mating with multiple males in fairly quick succession, and more. We are speculating that because Brutus, the dominant male of years gone by who imposed his order and discipline on the area, is not around, the other males are struggling to control the sanctuary. To say it's been quite an exciting and dynamic time is a massive understatement! There are some 4-year-old siblings up the estuary that play fight often and a female bear with yearling cubs. And, just today a mum with cubs of the year showed up in the estuary. We have just more than 2 weeks left in our 2015 Khutzeymateen season to experience all the wonderful things the bears show and teach us. It has been just a great year and it will be sad to leave! 15 February 2015 - Attention American Travelers and Friends! The low, low Canadian dollar is great news for American travelers. All prices for Ocean Light II Adventures trips are in Canadian dollars - so right now there is almost a 25% savings for anyone paying in American dollars. There is still space available on some Grizzlies of the Khutzeymateen trips in June, a Gwaii Haanas trip in July and our Marine Mammal Explorer in August. Contact Jenn at adventure@oceanlight2.bc.ca to find out more. Happy New Year! Our 2015 adventure tour season is ramping up already. Lots of bookings are keeping us busy and boat maintenance and upgrades are on-going. 20 December 2014 - Seasons Greetings! I'll keep this post really simple - Wishing all of you a very happy holiday season! Our season in the Great Bear Rainforest has wrapped up. We had 6 very successful trips and we saw amazing wildlife and beautiful scenes. This year there were many cubs in the Spirit Bear area, both black and white. It was fantastic to see...2013 was obviously a really productive fish year which translated into high birth-rate and survival of cubs. We also saw and had quality viewing of grizzlies and cubs in a couple of different areas. Our guests went home with a real good feel for what the Great Bear Rainforest has to offer. 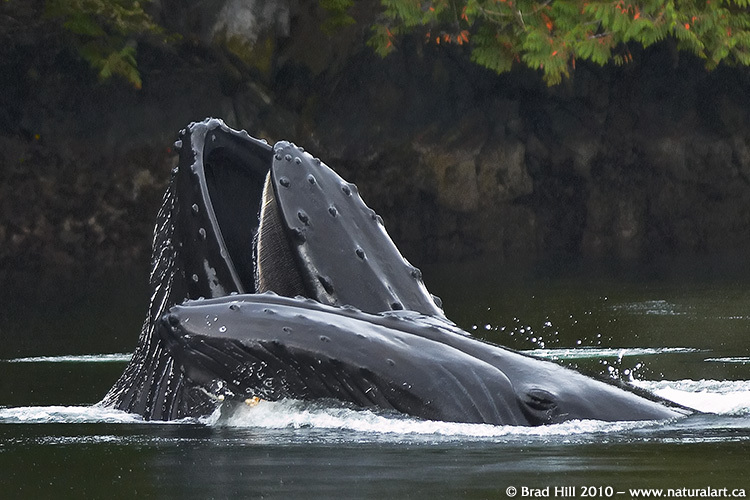 The waters of the Great Bear Rainforest were again alive with humpback whales. The rich waters provide food for the humpbacks in the fall before they make their long journey to the breeding grounds, we saw incredible bubble net and lunging displays. The Ocean Light II is now back in Gibsons, taking a much needed rest and getting some upgrades done. This dispatch comes to you from the Ocean Light II home office in Roberts Creek. I am at home, first time in 4 months! I have a 2 week break and then back to finish up the final 3 weeks of our Great Bear Rainforest trips. Chris and I worked our first Great Bear Rainforest trip of 2014 from Bella Bella to Hartley Bay. Again, a wonderful group of keen photographers and wildlife watchers joined us. It was a really wonderful trip, finishing with a phenomenal day of Spirit Bear watching in a beautiful location. We saw a salmon stream bursting with fish, some grizzly in Mussel Inlet, humpbacks all the way up the Inside passage, saw black and white bears in a couple of places, visited a sea lion haul out and soaked ourselves in warm refreshing hotsprings. Everyday but one was sunny, a little fog at times added to the mood and the scenery was as beautiful as ever. Tom and Christine are working for 2 weeks now and are remaining in the northern regions of the Great Bear Rainforest. News from the boat tonight is that there are 7 very happy photographers on board!! Keep checking back for updated news from the Ocean Light II in the Great Bear Rainforest. 30 August 2014 - Orca and More Explorer! We have just finished up 3 weeks of Marine Mammal Explorer trips in the waters of Northern Vancouver Island. We were blown away...the marine life and birds of the area are unparalleled. We are considering changing the trip name, to something more inclusive of all the diversity of the area; The Orca, humpback, minke whale, grey whale, sea lion, sea otter, seal, Pacific White-sided dolphin, Dalls porpoise, harbour porpoise Explorer. We had 3 amazing groups of keen people who got the very most out of every day and every experience. We kept a wildlife sightings log on a couple of the trips and each evening recounted all the amazing things we had seen that day. The lists were long and impressive and fun to do. Some highlights include; surfing sea lions, foggy mornings and humpbacks blowing, bow riding dolphins, mating seaotters, seeing orcas rubbing on the beaches, grey whale searching in the fog and pirate parties!! Amazing wildlife, phenomenal birds, great action and we can't wait to do it all again in 2015! Cheers from Jenn and Chris. 03 August 2014 - Newsflash! Large group of bubble net feeding humpbacks on Mainland Coast - AMAZING SIGHT!!! We sailed the Ocean Light II across the Hecate Strait in beautiful NW 20's, cutting our way through the white caps and the By the Wind Sailors (Jellyfish), with the sooty shearwaters soaring overhead and beautiful sunny blue skies. We arrived on the Mainland Coast near Caamano Sound and were greeted by over 30 humpbacks doing a group bubble net. It was incredible, something not seen from the Ocean Light II before in BC waters. Over and over the whales dove, came together under water, blew the bubble net and then exploded through the surface with their mouths wide open to capture the tiny fish and plankton. What a treat! Wow...what a summer! The rest of our Gwaii Haanas trips were really wonderful, the weather smartened up, giving us a taste of Gwaii Haanas in all conditions. We had impressive wildlife viewing and were treated to amazing orca encounters, two weeks in a row. We saw a pod of 9 orcas hunt a seal and when they were done, play in the waters just off our bow. We saw so many spy hops and tail slaps and even heard vocalizations out of the water. It was magical to hear the blows and watch the orca fins slicing through the flat calm waters of Juan Perez Sound with no one else around. Our final trip on the islands was a family trip with guests aged from 18 months to 75 years. We had 4 kids on board and Sarah loved showing them all the wonders of Gwaii Haanas that she grew up with. On this trip we re-visited Hotsprings Island and soaked our feet in the little hot pool that has formed just below the high tide line. Not quite as luxurious as in the past but the kids loved it and we keep hoping that bigger pools will be back in the future. All in all, a very successful 5 weeks of trips in the land of the Haida, where we are always impressed. Cheers from Jenn, Tom, Sarah, and Chris. Summer is here in Gwaii Haanas. We are just finishing up our second week of trips. Our first week was a Mothership trip with two kayak guides - Gord and Jennifer - on board. It was a wonderful week despite wet weather, rough seas, wind and fog. The conditions made the Mothership all the more desirable as we could come back after paddling or shore excursions to a warm, dry boat, deliciously cooked meals, and a comfy bed. We saw amazing things, including orcas, humpbacks, seals, sea lions, eagles, countless seabirds and enchanting Haida village sites….and all that on the first day! We saw a moon jelly fish spawn, By the Wind Sail Jellyfish by the millions, sea lion pups, an young orca eating a seal, fantastic sightings of both tufted and horned puffins and peregrine falcons. We dined on halibut, ling cod, yelloweye rockfish and crab and savoured all the home baked goodies. Our guests were super positive and enthusiastic about everything we did and experienced. Summer began on our second week, today it is calm and sunny with blue skies and a light breeze. We have continued to see amazing things - a humpback under a rainbow, sandhill cranes, orcas hunting seal, a shark, and incredible intertidal displays each morning from both the kayaks and the inflatable. A full moon over the Hecate Strait on a flat calm evening was a highlight. More great things ahead in the coming weeks - stay tuned! We are already 2 months into our season and I am writing this update while at anchor in a summer storm in Gwaii Haanas. The wind is howling, the rain is pouring down but we are warm, dry and cozy in the Ocean Light II. The storm will quickly pass and we will be back to exploring and discovering the beauty of these isles. We untied our lines from home base in Gibsons on May 2 and sailed north in beautiful weather and calm seas arriving in Prince Rupert almost a week later. After a quick re-stocking of the Ocean Light II we started our first Khutzeymateen trip on May 12. We began the trip exploring some of the areas outside of the Khutzeymateen. Our first day was a marine mammal extravaganza; humpback whales, California and Stellar sea lions, and harbour porpoises. Because it had been a mild winter on the north coast with minimal snow accumulation green grass was already sprouting. We visited the Kwinamass estuary and had great opportunities to watch and photograph grizzlies, wolves, birds, river otters and mink. We sailed into the Khutzeymateen on May 15 for the first of 40 magnificent days. The valley was at its best day after day and every group was rewarded with amazing experiences. 2014 was a big cub year - we had a female bear with two 3-year-old cubs which she weaned in early June. We had 2 other moms with 1 year old twins and a mom with a single 1 year old cub. The mom bears were amazingly trusting and allowed us to see incredible behaviours; cuddling, nursing, clamming, playing, sleeping, resting, and traveling to name just a few. The cubs are learning to be trusting too and very often we had the cubs approach to have a closer look at us. There were also lots of subadults and a few big males making their presence known. The estuary was always action-packed. On a few trips we were delighted to get up close and personal with a beautiful coastal wolf. We watched both grizzly and wolf take turns eating a seal carcass and for the first time ever, we followed two bull orcas as they explored the Khutzeymateen Inlet. The Khutzeymateen was kind to us in 2014, our guests left with a new understanding of the grizzly bear and with a renewed desire to help protect these magnificent creatures. Want to find out more about our amazing Grizzlies of the Khutzeymateen adventure trips? Just go here. Our 2015 trip schedule is already available. 26 September 2013 - Season Recap! Our spring and summer trips 2013 on the coast aboard the Ocean Light II are now done. We are well into our fall season and we continue to experience new adventures every day. The summer was fantastically successful - we were joined by wonderful people, had phenomenal weather and saw amazing wildlife and wild places. Right now we are a couple of weeks into our Great Bear Rainforest season. So far, everyone is leaving their trips fully satiated and satisfied. The pink salmon are returning to the creeks in big numbers, the white, black and grizzly bears are heading down to the creeks and rivers to feed and the humpback whales are everywhere and putting on a show constantly. Detailed Great Bear Rainforest updates and highlights coming in late October. Find out more about our Great Bear Rainforest Explorer trip right here! In August we moved the boat down to northern Vancouver Island from the Khutzeymateen to do our Marine Mammal Explorer trips. Again - for the 5th year in a row - the marine mammal experiences were just great. On all 3 of our trips we got to see so many different species and witness some incredible behaviours. We watched orcas spy-hopping and breaching, we watched grey whales feeding from the shallow bottom for hours, humpbacks lunging, bubble feeding and gaping, we saw sea otters asleep wrapped up in the giant kelp and sea lions surfing both in and on the waves. We kept a list of all the species we saw and actually ran out of space on the wall to record them all. We had 2 trips with kids on board and watched as they were turned on by the diversity of our incredible oceans. There were lots of salmon in the area this year and we tried some fishing and caught some dinners. The more time we spend in Orca waters the more we learn and the more we refine our itinerary to experience the absolute best of the area. It is a truly fantastic trip - just so diverse and exhilarating. Join us in August 2014, it definitely will be the journey of a lifetime. You can learn more about this fascinating and unique trip here! After our Mothership Tour we did 3 weeks of our regular Gwaii Haanas trips. Regular is not a good word to use to describe these trips! The trips were simply spectacular, as only Gwaii Haanas can be in the middle of summer. Glorious days, peaceful nights, flat calm seas, light breezes, waterfalls, hiking, fishing, beachcombing, exploring, sailing. Our guests got the chance to really live and breath Gwaii Haanas. Magical days one after the other. There really is no trip to compare to Gwaii Haanas - each day totally unpredictable as we let the events unfold as they will. Our guests were incredible, coming from different walks of life and joining together to create easy-going, ready for anything groups of adventurers who got the most out of everyday. We thank each and everyone for joining us and allowing us to lead such rich lives in such beautiful places. Learn all about Gwaii Haanas - and our trips to this amazing National Park and Marine Reserve - right here! Our third Mothership Tour in Gwaii Haanas was everything we could have expected and more. Ocean Light II Adventures operates the only fully guided Mothership Tours on Haida Gwaii. We take 8 guests and have 1 fully certified guide and 1 assistant guide to lead the daily paddles. Our guests are provided with excellent leadership and instruction and can feel confident that their safety is a priority. Our group this year paddled into new areas on each and every day, and at the end of a long paddle they always had a comfortable base to return to - and the opportunity to move on to see new places. We got to experience the best of Gwaii Haanas by both sailboat and by kayak and we were able to explore more areas more intimately by combining kayaking with transport by sailboat. There were many highlights - we had a glorious morning on the Hecate Strait, the flat calm water was boiling with krill and little fish and many humpback whales were having a feast all around the Ocean Light II; we saw gorgeous sunrises, breathtaking sunsets and had sunshine all day everyday; we paddled, we walked, we fished, we relaxed, we learned about the Haida culture, we explored and then we paddled some more. All in all it was a great week with enthusiastic adventurers. Our 2014 Mothership Tour is scheduled for late June and we expect it to be just as exhilarating as in 2013. Why not join us? You can find all the details about this unique way to experience Gwaii Haanas right here! Our 2013 Khutzeymateen season was a huge success. This was the first time Ocean Light II Adventures was permitted to be in the estuary for 40 days - and it was 40 days of unparalleled bear viewing. We began our season on May 9 with a 1-week trip that started in another estuary just north of the Khutzeymateen called the Kwinamass. We had enthusiastic adventurers and found bears in new places. We finished up the week in the Khutzeymateen and every day offered something exciting. We then began our cycle of 3 and 4 day trips that continued until June 20. It was a very early spring this year, the snow pack was higher, the grasses were already green when we arrived and the flowers were at least a couple weeks ahead of past years. The overall number of different bears that we saw during out time in the valley was significantly less but the intimate nature of the bear encounters that we did experience more than made up for it. There seemed to be less female bears around than normal. Consequently when the big males moved through looking for a mate they found none and just kept moving. Our best bear viewing was of a female and her two three-year-old cubs. They found a place in the estuary where they were comfortable and allowed our guests truly incredible viewing experiences day after day. Everyone who had the chance to watch this bear family went home with a real appreciation for the gentleness of which bears are capable. Memory cards were filled daily and downloaded and then refilled the next day. One incredible experience which was a first for Ocean Light II Adventures after 25 years in the Khutzeymateen was the appearance of a humpback whale mother and calf right beside the boat in the estuary. It was an unforgettable sight. Overall it was a great time with brilliant bears, incredible weather and keen, kind guests. A very big thanks to all who joined us! Want to find out more about our amazing Grizzlies of the Khutzeymateen adventure trips? Just go here. Our 2014 trip schedule is already available. Ocean Light II Adventures supports the efforts and philosophy of the Creatively United for the Planet Festival. The Festival takes place in Victoria, BC from April 19-21, 2013. For more information, check out creativelyunitedfortheplanet.com. The feature event of the festival is a talk by Charlie Russell, who is renowned worldwide for his ground-breaking work with grizzly bears in both Canada and Russia. Charlie worked with Ocean Light II Adventures for a number of years before striking out on his own. We strongly support Charlie's efforts to conserve bears around the globe. Ocean Light II Adventures is supporting the festival and Charlie's bear work by donating a 4-day trip for 1 person to the amazing Khutzeymateen Inlet and grizzly sanctuary. The trip is a silent auction item and proceeds will support both future festivals and key environmental initiatives. It is valued at $2100. For more information about the silent auction, just check out the Creatively United Blog. So...if you're free and within easy traveling distance of Victoria - you can have some fun and do some good at the same time! Any maybe even get a great deal on a once-in-a-lifetime trip! The Government of British Columbia manages many of the natural-occurring carnivores found within its borders as pests or "vermin". This is particularly true of wolves - despite hard scientific evidence of the value of wolves, the BC government actively culls them, often at the request of ranchers. And, to make matters worse, the most common way they kill wolves is through the use of killing neck snares. These snares have been labelled as "inhumane" by international agreements (to which Canada is a signatory to) and they cause slow, painful deaths on any animal that wanders into them. Thanks for caring - and thanks for taking the time to speak out against the cruelty and inhumanity of the neck snares. In late June 2013 we will be offering our 4th Mothership Kayaking trip. The interest in this type of trip is growing fast. Mothership kayaking is a great way to get the best of both worlds: the comfort and decadence of the 71-foot Ocean Light II and the adventure and challenge of sea kayaking. Each day we will move to a new location to launch the kayaks and explore the beautiful Gwaii Haanas archipelago more intimately. Our expert and well-travelled guides, Gord Pincock and Barrett Johnson, will lead the daily kayak journeys and will be available to teach you the intricacies of the sport. With the Ocean Light II we will be able to move more efficiently to our next destination and therefore we will be able to experience so much more. We intend to visit not only all the regular cultural sights but also explore some of the less visited but equally magnificent locations. On the Ocean Light II you will be given a berth that doesn't need to be packed up daily; you will be able to keep warm and dry; you will be able to dry out your wet kayak clothes at the end of each expedition, and you will be served delicious, nutritious meals. We will visit old growth forests, sparkling streams, rocky beaches and sandy shores. We will watch whales, visit busy sea lion haul-outs, explore rich, colourful, intertidal zones, and see black bears, deer and a multitude of birds. We will try our hand at fishing and if the winds cooperate we will travel by sail. There is so much to see, do and experience. If you're Interested in joining us you should contact us soon - there are only 8 spots available for 2013. Visit our Mothership Kayaking page for more information. Ocean Light II Adventures officially opposes this plan. We have spoken out against it and we strongly encourage you to do the same. 1. For suggestions on what to include in your input to the plan, see the 3 December 2012 entry. 2. For a detailed examination of the validity (or complete lack of validity!) of the "science" behind the plan, see the 21 November 2012 entry. 3. For rebuttals to the main arguments proposed by those in favor of a wolf cull and demonstrations of the extreme bias of the management plan, see the 29 November entry. Thanks for caring - and thanks for taking the time to speak out against this disgusting plan. Today, the Ocean Light II is expected to slip into her regular berth in the Gibsons Harbour. While we had a few mechanical challenges over the past 5 months, The Ocean Light II deserves a bit of congratulations. As it has for decades, the Ocean Light II kept us all comfortable, warm and dry and safely showed us the wonders of the BC Coast. Clean up starts tomorrow, emptying her out, taking off the sails and washing her down. Next week, we'll head to Vancouver to haul her out of the water and start the process of repainting the hull and doing general maintenance. Then we'll tarp her for the winter and start getting excited about 2013. We hope to see you aboard the Ocean Light II again (or for the first time) sometime in the future! The Great Bear Rainforest trips have just ended and our guests have gone home fulfilled. Chris and Jenn did 3 weeks of trip and Tom and Barrett also did 3 weeks. We all got a taste of the best that Rainforest has to offer and a taste of the wind and wet that can make the trips challenging. Overall the weather was quite typical of a rainforest but very manageable. The grizzly and Spirit Bear viewing was incredible and the humpback whales were an added and very special bonus. We feel it's important that visitors to the Great Bear are aware of the very real threats that this globally unique ecosystem currently faces. The BC coast must be protected from oil tankers, pipelines and spills. October 24 is a day for action. Find a community near you: http://defendourcoast.ca/actions and join in the push to protect our rivers and our coast. If you'd like to find out more about visiting the spectacular Great Bear Rainforest in 2013 or beyond, just take a few minutes to browse our Great Bear Rainforest trip page. The Ocean Light II and her crew and passengers have just had 3 weeks of intense Marine Mammal viewing. We saw 12 different marine mammals: resident orcas, transient orcas, humpback whales, grey whales, pacific white-sided dolphins, dall's porpoise, harbour porpoise, stellar sea lions, california sea lions, sea otters and harbour seals and northern fur seals. The summer weather was at its finest and the seas were almost always calm. We started each day not really knowing what to expect but we were never disappointed. We kayaked with the whales, heard their fascinating calls through our hydrophone, watched them singly and in large pods. We heard them in the night gracefully passing by our anchorage. We got up close and personal with the sea lions and had better sea otter viewing than ever before. The trip has so much to offer, we're already excited for what lies ahead in 2013. For more information about this great trip just check our Marine Mammal Explorer trip page. 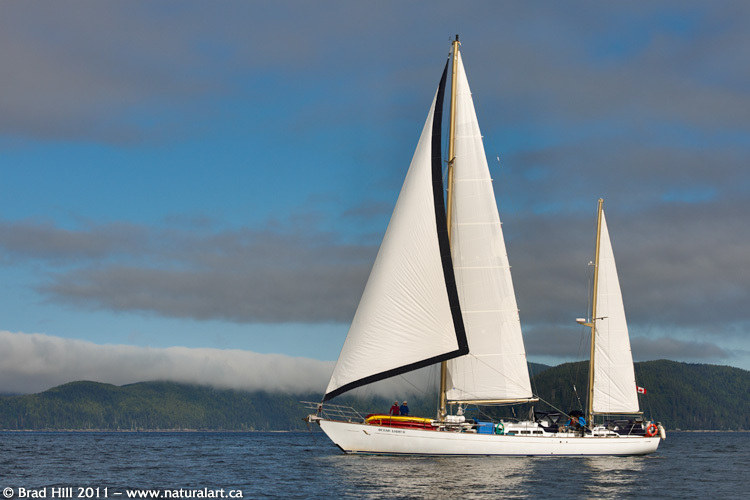 The Ocean Light II has just had 5 weeks of classic Haida Gwaii weather and experiences. 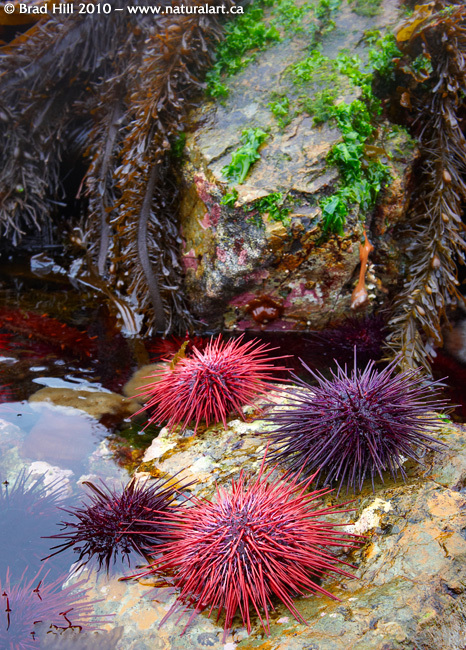 There is never a dull moment in Gwaii Haanas - something interesting and beautiful is always popping up. We started with a photo tour week where our guests worked from dawn to dusk to capture the magic and diversity of the islands. Then on our final 3 trips, everything came together perfectly! We had a group of friends reuniting for a week on the boat with lots of laughs and exceptional camaraderie and we had 2 groups of individuals that jibed incredibly well and saw the islands at their best. We visited all the regular sites plus lots of unexpected extras. The kayaks were in the water all the time and we hiked, walked, beach-combed, watched wildlife, sailed, soaked in the hot springs, fished and relaxed. Everyone went away impressed with what the islands offer. You can find out more about our trips to Gwaii Haanas National Park right here! We have just wrapped up our Gwaii Haanas Mothership trip for 2012. It was a great trip, with wonderful people...and the overall consensus was "Thank goodness we had a Mothership". While the weather was challenging, we did start and end the trip in the sun. But for the majority of the trip, it rained. That didn`t stop the kayakers - under the expert guidance of Gord and Barrett they went out in wind and rain each day and returned to the boat exhilarated. When back at the boat we dried out the gear, had warm drinks and hot meals and always felt warm, dry and safe. We visited all the regular spots that make Gwaii Haanas so special - Hotsprings Island, Burnaby Narrow, Tanu and Skanggwaii. We also had many opportunities to explore in more isolated bays and inlets. In addition to our daily paddles we visited sea lion and seal colonies, watched whales, walked in old growth forests, caught a halibut and beach-combed. We will be doing another Gwaii Haanas Mothership Trip in 2013 - why not join us? You can find out more information about our Mothership trips right here! Spring on the BC Coast had a cold start this year, with cooler temperatures, a larger-than-normal snowpack and a fair bit of wind and rain. Fortunately, these conditions didn't seem to affect the grizzlies of the north coast - we spotted our first bear on May 10 and had continuous great bear encounters from then until our departure from the Khutzeymateen on June 15. We started our season outside of the Khutzeymateen, exploring some other river estuaries and coastal islands. It was rewarding to see such healthy bear populations in new areas and enjoy the thrill of exploration. The Khutzeymateen was spectacular for an entire month, a reminder of why we choose to visit at this time of year. Each day was a new experience as we watched the lush, green sedge grasses grow, the leaves unfold on the devil's club and the snowpack melt and slide off the mountains. We saw the colours slowly emerge in the estuary as the paintbrush, buttercups and lupines started to bloom. The bear watching was incredible. There were lots of big bears, many sub-adults and even a few mums with cubs! And they showed us a huge variety of behaviors: wrestling, courting, mating, traveling, swimming, sleeping, clam digging and grass eating. We were also fortunate to see a number of wolves, river otter, mountain goats, deer and mink. All of our guests went away from the Khutzeymateen with a new appreciation of the mighty grizzly bear and some incredible photos. Besides managing the boat, acting as the full crew, and working wonders in the kitchen, Jenn volunteered on behalf of the Pacific Wildlife Foundation and supplied the legwork needed to create a new British Columbia Bird Atlas. With the help of many guests, she created a very comprehensive list of the bird species that use the Khutzeymateen in the spring. Ocean Light II Adventures enjoys actively participating in research activities such as this bird survey, as well as assisting in marine mammal identification programs and documenting bear sightings. The Ocean Light II is now in Gwaiii Haanas, ready to begin 6 weeks of trips through this spectacular archipelago. Check back to our site in a early August for highlights from Haida Gwaii! For those considering joining us in the Khutzeymateen (or on any other trips) in 2013 and beyond - trips for 2013 are filling up fast...so to avoid disappointment contact us and book your trip soon! 12 June 2012 - Petition to Stop Canada's Proposed "Environment Devastation Act"
 It repeals the Canadian Environmental Assessment Act and introduces a weaker version, without a single day of hearings before the environment committee.  It removes protection of endangered species and their habitat, when approving pipeline projects, by amending the Species at Risk Act and the Navigable Waters Protection Act.  It guts the Fisheries Act by removing provisions for habitat protection.  It repeals the Kyoto Protocol Implementation Act.  It eliminates the National Round Table on Environment and Economy. For background or additional information we encourage you to visit this page on the Green Party of Canada's website or this page on the CBC.ca website. Thanks for your time and for your concern for Canada's wilderness. We're often asked to send folks more pictures of our boat, especially interior shots. We're proud of our beautiful boat, so here you go! Just check our About Our Boat page and click on the thumbnails along the right-hand side. Our complete 2012 trip schedule, including trip dates, prices and brochures, are now available for viewing. Looking for a unique gift idea for someone special - or possibly a gift to yourself? Our trips offer a fantastic getaway. Immerse yourself in nature, breathe fresh air, watch incredible wildlife, have fun with fellow travelers, relax - all while eating delicious food! So why not join us for an adventure of a lifetime? Our Haida Gwaii trips are perfectly suited for families or groups of friends because there is so much to see and do and you have great opportunities to spend quality time together while creating some wonderful joint memories! Our bear viewing trips to both the Khutzeymateen and the Great Bear Rainforest are world class and are filling up very quickly. Or, you can always join us for one of our newer trips, the Marine Mammal Explorer or our Mothership Kayaking Adventures - both are fantastic adventures and offer the best of the beautiful BC coast. We're very excited about sharing our beautiful coast with you in 2012 and beyond! We have just wrapped up our 2011 season and it was a great success. The Ocean Light II cruised through the waterways of the Great Bear Rainforest searching for spirit bears, grizzly bears, wolves and whales. All of our trips featured incredible wildlife viewing - yet each trip differed from all the others and produced unique memories for all aboard. On the water the humpback whales were amazing as they powerfully yet gracefully moved around and under our boat. We watched them bubble-net feeding, lunging and breaching and had ample opportunities to get tail photos. 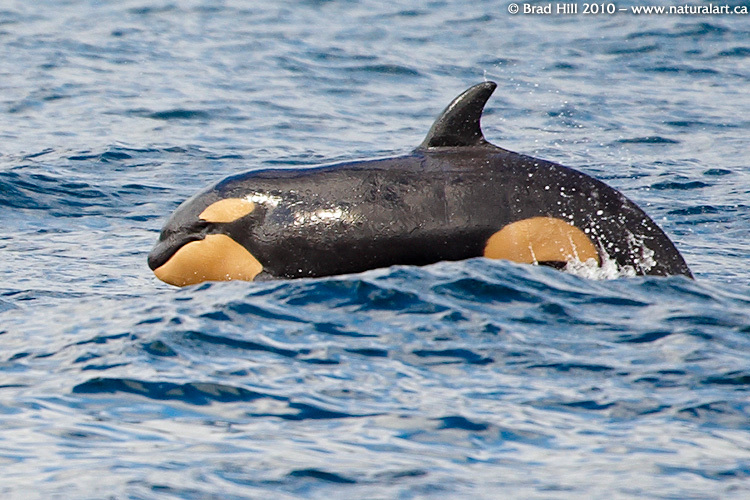 We also saw lots of orca whales this fall, as well as dolphins, porpoises, sea lions, seals and more. On the land the bear viewing was everything we expected. All of our trips had unforgettable Spirit Bear experiences. The grizzly bears, black bears and wolves also put on a show. As always, the autumn weather gave us some challenges, with lots of rain and some big winds. But the Ocean Light II and her crew maximized the adventure experiences and kept everyone happy and safe. The salmon runs were impressive. There were lots of pink salmon returning to their natal streams, as well as chum, coho and sockeye. The live salmon in the creeks attract many other animals for a chance of a meal of fresh fish. The dead and dying spawned out fish continue to give back to the land and sea. The Ocean Light II is now tied to the dock in Gibsons, where she will stay for the winter. We will spend some time over the winter and spring on general maintenance and upgrades and will have her ready to set sail again in May 2012. Hope to see you again - or for the first time - on future trips aboard the Ocean Light II! The Ocean Light II is currently navigating and touring the rich waters of the Great Bear Rainforest. We have 5 weeks of trips this fall. And, we're already receiving good news back from the Ocean Light II - the pink salmon are returning in great numbers to their natal streams and the chum salmon are also back in good numbers after 5 years of low returns. All of life in the Great Bear Rainforest is wholly or partly dependent on energy and nutrients supplied by the returning salmon. This year it appears that the bears and wolves will be well fed. The grizzlies are already fishing in the rivers and the black bears and spirit bears are joining in the feast. Check back soon to this page to get the latest news on what's happening in the Great Bear Rainforest. For 3 weeks in August the Ocean Light II and her crew cruised the waters of the Orca whale on the northern tip of Vancouver Island. Again the weather was fantastic and the marine mammal viewing spectacular. We saw orca whales, individually or in large groups of up to 30 whales doing a wide variety of activities: resting, hunting, spy hopping, travelling, and fishing. We were able to listen to their vocalizations on our hydrophone. Humpback whales are now a common sight in the nutrient rich waters of the region and we saw spectacular displays of breaching and lunge feeding. We visited a large sea lion haul-out and got to see, hear (and smell!) these amazing large beasts. We had great sightings of sea otters and had lots of chances to see classic sea otter behaviour: cruising along on their backs, using a rock on their belly to crack open their food and their constant rolling to get air into their fur to maintain body heat. Overall the best thing was how many different otters we actually saw, especially all the mothers with babies - the recovery of this previously endangered species is well underway and with good reason for hope for their future. We started each trip in the relatively calm waters of Johnstone Strait and Blackfish Sound and then moved west to the wilder, more exposed north western tip of the island. We explored on white sandy beaches and investigated colourful tide pools, kayaked in tranquil bays and anchored under starry skies. The Marine Mammal Explorer trip is so much more than Orcas - it is truly an experience not to be missed. Want more information about our 2012 Marine Mammal Explorer trips? Just check out our Marine Mammal Explorer page on this website for lots more information. Several spots still remain for 2012 trips. 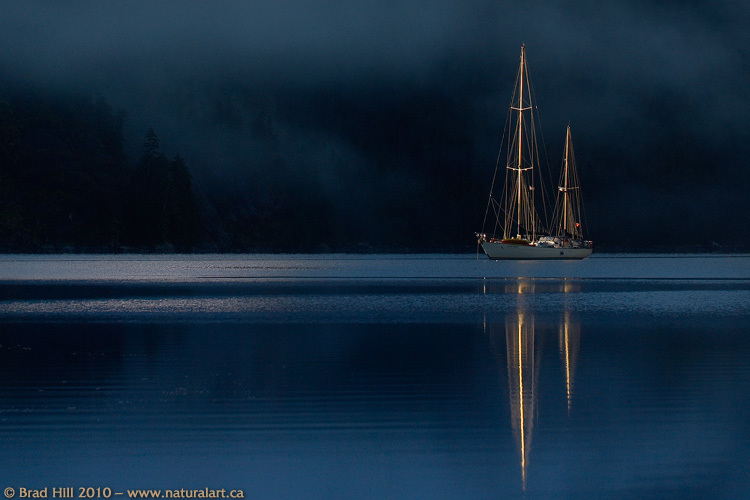 The Ocean Light II and her crew spent 5 glorious weeks in Gwaii Haanas in July and early August. While the rest of the province was waiting for summer to begin, Gwaii Haanas was basking under sunny skies and little wind. This year - like in past years - we had 5 really great groups. The island archipelago offered up a huge diversity of activities that remains unparalleled anywhere on the coast. We had thrilling sailing experiences, watched gorgeous sunrises and sunsets, mellowed out on the carpets of moss beneath giant old growth trees, relaxed in the hot springs, kayaked at low tide with the colourful intertidal life and had beach barbecues of salmon and crab. We hiked in the alpine and swam in waterfalls, and our groups had an introduction to the Haida culture at the village sites of SgangWaay and Tanu. We made our way to the most southern tip, Cape St. James on a number of trips and caught some nice fish. And, of course, the wildlife viewing did NOT disappoint! Aquatic mammal sightings included humpback whales, fin whales, orcas, sea lions, seals and sea otters. Piscine highlights including sightings of blue sharks, sunfish and schools of jellyfish. On the bird front key sightings included horned and tufted puffins, peregrine falcons and sandhill cranes. In Gwaii Haanas every day is a feast for the senses! We ended our time in Gwaii Haanas much richer for the experience and energized. Check out our Gwaii Haanas Aboard the Ocean Light II page on this website for more information about this unique destination and adventure experience - spots are still available on several trips for 2012. Sarah is the daughter of the owners of Ocean Light II Adventures (Tom & Jenn) and has spent almost every spring of her young life in the Khutzeymateen Valley! Feel free to email Sarah to let her know what you think of her video! Our first Northern Great Bear Rainforest Mothership Kayak trip was a huge success. Our group got to spend a lot of quality time in the kayaks, travel to many different areas and eat delicious meals and sleep in comfort aboard the Ocean Light II. We started our trip out of Prince Rupert and made our way north back to the Khutzeymateen Inlet where we had a day and a half of incredible bear viewing. Each day our kayak guides - Gord and Barrett - took the group for a paddle. The diversity of these paddles was amazing, from the forested coastal fiords to the wind swept rocky outer coast, the group saw grizzlies, whales, seals, sea lions, and coastal wolves. Each day offered something new and exciting. For more information about mothership kayaking with Ocean Light II Adventures, visit our spanking new Mothership Kayaking trip page! 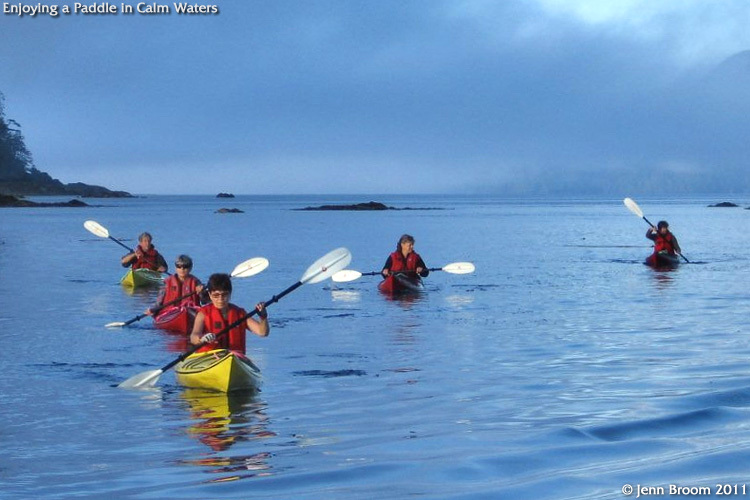 Our 2012 Mothership Kayaking trip is in the spectacular Haida Gwaii (formerly known as the Queen Charlotte Islands). Our month in the Khutzeymateen was incredible. From the very first day we were rewarded with exciting and intimate bear viewing experiences. The Khutzeymateen never fails to show all of us the beautiful and gentle side of the magnificent grizzly bear. It was a late spring on the coast this year and there was a lot of snow on the mountains. However, the bears emerged as always from their dens ready to eat the succulent protein-rich sedge grasses. At the beginning of our season we saw lots of different bears, including some very big males searching for females. There were not many breeding females around so the big males moved off and females with cubs appeared. In total we saw 7 mothers with cubs. A highlight was one mother who brought her cubs-of-the-year into the inlet and was very comfortable being watched. We also had a mother bear with three 1-year-old cubs in the estuary and a mother bear with two 1-year-olds in the inlet who provided hours of entertaining bear viewing. Stay tuned to this news page for the premiere of Sarah's 2011 video that she worked on while in the valley. Check out our Grizzlies of the Khutzeymateen page on this website for more information about this amazing destination - available spots for our 2012 trips are disappearing fast! We're now a little over halfway through our spring Grizzlies of the Khutzeymateen bear-viewing season and a good time is being had by all! Like almost everywhere in BC the growing season is about 2 weeks behind normal, and the bears were a little slow in arriving back in the Khutzeymateen sanctuary. But things are hopping in here now and we've seen an amazing variety of grizzlies and grizzly behavior - everything from males courting females, mothers with cubs, some sparring, and one instance of a female mum defending her cubs against an aggressive male. We've even seen coastal wolves twice - on one occasion the wolf was carrying what appeared to be a rather luckless river otter! And the lupines and other wildflowers are now in full bloom, providing spectacular settings and backdrops for the bears. The "Garden of the Grizzlies" is certainly living up to its name this year! 11 May 2011 - Our 2011 Season Begins Next Week!!!! Over this past winter we worked hard on maintaining and improving the Ocean Light II and to get her in tip top shape for the long field season. And that season begins next week! The Ocean Light II headed north last week from Gibsons Harbour en route to the Khutzeymateen Valley. Our 2011 Khutzeymateen trips start May 16 and continue through until June 18. We anxiously await getting back to the Valley of the Grizzlies and are excited about showing new people how incredible these large carnivores can be. We also welcome many repeat guests who can't get enough of the magic of the Khutz. Our first Mothership Kayaking trip in the Northern Great Bear Rainforest follows our Khutzeymateen trips and then it's off to Gwaii Haanas National Park in July. We have lots of adventures to look forward to, and we still have a few odd spots open. So if you want to join us, check out trip availability on our main Schedule page or email us at adventure@oceanlight2.bc.ca. Hopefully we'll see you soon! Curious about the scenery and wildlife of the Johnstone region of northern Vancouver Island? We've just completed updating the image gallery of our Marine Mammal Explorer trip page with images captured during the 2010 trip. Check 'em out and enjoy! Just click on the image thumbnails to view larger versions of the images. Are you looking for the adventure and challenge of kayaking but love the comfort and decadence of sailboat travel? You can now have both! Ocean Light II Adventures is offering Mothership Kayaking trips on the northern BC Coast and in Haida Gwaii (the Queen Charlotte Islands). Using the beautiful Ocean Light II allows us to move more quickly between the highlights of the area so that we can then get into the kayaks to explore more deeply. The Ocean Light II also provides you with a warm, dry bed and gourmet meals. Our kayak guides are from Butterfly Tours, who have been offering kayak trips in Haida Gwaii for over 20 years. 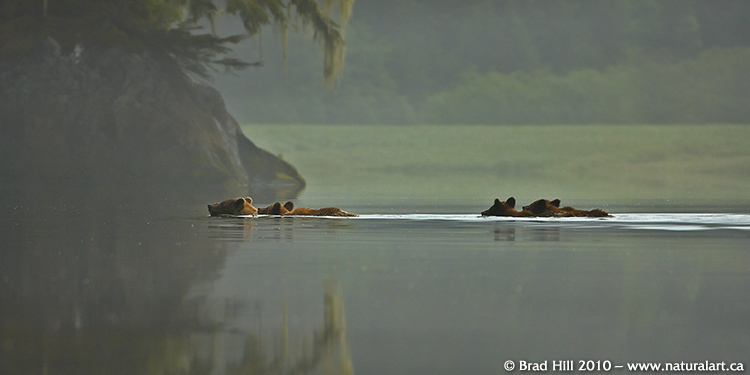 In 2011 we will be exploring the Northern Great Bear Rainforest in late June. We will travel deep into coastal fiords of old-growth trees and grizzly bears. We will also explore the salty outer coast with its rocky islands, sandy beaches and marine wildlife. 2012 will see us travel the entire length of Gwaii Haanas National Park in Haida Gwaii to kayak and sail through this amazing archipelago. Haida Gwaii is often called the “Galapagos of the North” and Gwaii Haanas National Park offers amazing biological and native cultural riches to its visitors. Our 2011 trip is fully booked, but join us in 2012 in Haida Gwaii or again in the Great Bear Rainforest in 2013 and experience an adventure of a lifetime. For more information about mothership kayaking with Ocean Light II Adventures, visit our spanking new Mothership Kayaking trip page! So...just what IS a Spirit Bear? The almost mythical Spirit Bear is a very rare, white-phased form of the American Black Bear. The subspecies of Black Bear found within the Great Bear Rainforest is Ursus americana kermodei – the Kermode Bear. All the black bears in the Great Bear Rainforest (of any coat colour) are Kermode Bears. 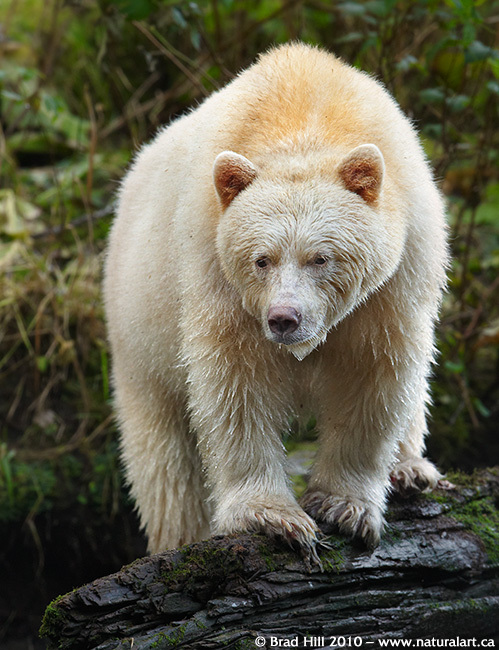 But not all Kermodes are white – only the rare Spirit Bear possesses the white coat. Are Spirit Bears just albino Black Bears? No, the white coat colour is actually the result of a recessive gene and only those bears with two copies of the gene (one inherited from the mother and one inherited from the father) have white coats. Bears that possess one copy of the recessive white coat gene and one copy of the gene for a “normal” coat have typical black coats and are carriers of the trait. The white coat colour of Spirit Bears can theoretically be found in Black Bears anywhere, but they are exceptionally rare in all parts of the Black Bears' range. The one exception is on a small portion of the BritishColumbia coast, where, for reasons that are only poorly understood, between 10 and 20 per cent of the bears are white. Where are Spirit Bears found? The elusive Spirit Bears are found most predominantly on islands within the Great Bear Rainforest on the coast of British Columbia. The region is isolated, rugged and wild and accessible only by boat. In island populations the double recessive “white” gene shows up more regularly. The best time to look for Spirit Bears is in the late summer and fall when the rivers and streams are full of spawning salmon. Why the white coat colour? At present scientists aren't sure why Spirit Bears are found in such a high proportion within portions of the Great Bear Rainforest. But, a legend of the Tshimshian First Nations provides one explanation: Raven came down from the heavens and turned every tenth black bear white to remind him of when the land was covered with snow and ice. Raven also decreed that the Spirit Bears would live forever in peace. What's the best way to see or photograph Spirit Bears? Good question! Ocean Light II Adventures has been taking people to see Spirit Bears and their habitat for close to 20 years. For more information on Spirit Bears and how you can view them, check out our Great Bear Rainforest Explorer Trip! We've just added information (including full schedules) for our 2012 trips. To view the entire 2011/2012 slate of trips, visit our Main Schedule Page. 1. Grizzlies of the Khutzeymateen. 2. Haida Gwaii (Queen Charlotte Islands) Aboard the Ocean Light II. 3. The Marine Mammal Explorer. 4. The Great Bear Rainforest Explorer. Many of our trips fill up very early. So if you're considering taking in one of our fantastic adventures in 2011 or 2012 contact us soon! One of our favourite places on Planet Earth is a region known as the Great Bear Rainforest and we are so lucky to be able to consider it our backyard. It is located on the northern coast of British Columbia and is the largest temperate rainforest left on earth. Not only is this pristine wilderness home to grizzlies, wolves, rare Spirit Bears, massive old growth trees, orcas, humpback whales, Pacific salmon and countless other species of plants and animals, but it stores the same amount of carbon dioxide annually produced by 28 million vehicles. To call the Great Bear Rainforest absolutely invaluable may be the biggest understatement ever made. Here's the scoop...Enbridge – the world's largest pipeline company – is pushing to build a pipeline from the Alberta Tar Sands across northern BC to Kitimat, BC, where the crude oil will be loaded onto super-tankers which will travel through the narrow channels of the Great Bear Rainforest. With 250 oil tankers navigating these challenging waters each year, there is no doubt there will be oil spills – the only real questions about the inevitable spills are "when? ", "where? ", and "how bad?". You would think that after the recent Gulf of Mexico disaster that we'd have learned something? It will take just 2 minutes of your time - stand up and have your voice counted. The Ocean Light II is now safely tied to the dock at the Gibsons Harbour after completing a very successful 6 weeks of trips in the Great Bear Rainforest. We had 6 fantastic groups of photographers and nature enthusiasts and each trip had something unique to offer. Despite the news reports of fantastic sockeye salmon returns in the Fraser River, the salmon runs on the north and central coast were not nearly so productive. According to the Fisheries creek walkers, the returns of pink and chum salmon to the rivers and creeks of the Great Bear Rainforest were very low. Both black and grizzly bears are more dependent on these salmon species than on the sockeyes for their survival and reproduction, so these poor runs can (and likely will) have a signficant biological effect on the bears and other inhabitants of the Great Bear Rainforest. During our 6 weeks of exploration, we found that the bears were fishing in the creeks as always, sometimes catching a rare live fish but always content to eat the spawned out dead ones. And, our guests had some wonderful grizzly and spirit bear experiences. To learn more about the future of the wild salmon on the coast and why it is so critical to conserve them, please visit the Wild Salmon Project page on the website of the Raincoast Conservation Foundation. The humpback whale viewing was phenomenal. On many occasions we had humpback whales approach the boat and lie on the surface so we could see from the hair follicles on the nose to the barnacles on the tail. We also ran into porpoises, orcas, sea lions and the occasional elephant seal. As expected the weather was very challenging at times. The central coast was buffeted by wind and rain on a couple of the trips and our guests got a real feel for the what the inhabitants of the rainforest face in their daily lives! There are some very real threats to the Great Bear Rainforest area at this time. The fight to stop the transport of Tar Sands oil on tankers through the narrow inlets and channels of the Great Bear Rainforest is gaining momentum. To stop Enbridge from building a pipeline we all need to pitch in and join the battle! You can help by signing the online petition sponsored by the Dogwood Initiative - it takes only a few minutes. We've already done so. Thanks for your help! In 2010 we introduced our first-ever Marine Mammal Explorer Tours. From August 18 through 29 we ran both a 4-day and a 7-day exploration of the beautiful Johnstone Strait region of northern Vancouver Island. Both were great successes and the whale and other aquatic mammal viewing (and photography!) was just fantastic! Between the two tours we saw large numbers of Orcas, as well as Humpback Whales, Grey Whales, a Minke Whale, both Harbor and Dall's porpoises, Pacific White-sided Dolphins, Harbor Seals, Steller's Sea-Lions, and too-many-to-describe seabirds! On our 7-day tour we even had several sightings of the endangered Sea Otter! Based on the success of the trips (and, of course, the satisfaction of our guests! ), we'll be offering the Marine Mammal Explorer trip as both a standard wildlife viewing tour and a specialized photo tour in 2011. If you're interested in joining us in 2011, just visit our Marine Mammal Explorer page for additional information! From June 19 through August 8 we sailed the waters of Haida Gwaii. Each and every day offered fantastic experiences! Our first trip was a charter for Parks Canada with a High Definition film crew, and we worked hard and moved around thousands of pounds of gear and equipment to help them capture the magic of the islands. We had many firsts this season. We did our first Mothership Kayaking trip (in conjunction with Butterfly Tours) in late June and it was a complete success. All 8 paddlers and 3 guides enjoyed the wonders of Gwaii Haanas National Park from both the cockpit of a kayak and the comfort of the Ocean Light II. We hope this is the only the start of many more Mothership tours in the future! We saw our first ever sea otter on the islands, which was a real treat. And, on a glorious sunny day we sailed down the entire length of the national park on a beautiful westerly wind and watched whales as we flew past. The weather was incredible - sunny days one after another and we ended up swimming regularly in cascading waterfalls and alpine lakes. With our fantastic groups of guests we explored the richness of the tidal zone and the serenity of the old growth forests, watched wildlife both on land and in the water, and delighted in the diversity of birdlife. With the help of the Haida Gwaii Watchmen we toured several ancient Haida villages and experienced the rich cultural heritage of both the past and present life of the Haida people. And on our final night in Gwaii Haanas we were treated to a glorious sunset and a pod of Orcas swimming past - a very fitting end to our successful 2010 Charlottes season! 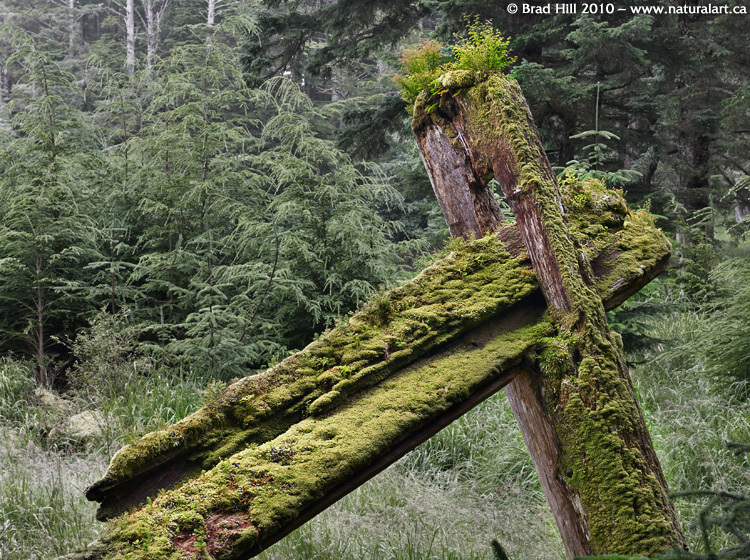 Interested in joining us in Gwaii Haanas in 2011? Visit our Gwaii Haanas Aboard the Ocean Light II trip page for more information about this unique eco-adventure! It was announced in early June that the Government of Canada is extending Gwaii Haanas park protection from the mountaintops of Haida Gwaii (formerly known as the Queen Charlotte Islands) to far out on the ocean floor on the West Coast of BC. The existing Gwaii Haanas National Park will become Gwaii Haanas National Marine Conservation Area Reserve. It's the culmination of an environmental protection fight that began 25 years ago over the logging of old growth forests on South Moresby. The new seabed conservation area extends 10 km offshore from the existing Gwaii Haanas Reserve to protect a 3500 square km piece of the Hecate Strait and Queen Charlotte Shelf marine region. About 3500 species of marine life populate the waters. It is the first place on the planet where protection of the ecosystem will stretch from 2000 feet below the sea to mountains tops 4000 feet high. This landmark decision officially recognizes the incredible biological diversity and cultural significance of both the land and sea in Gwaii Haanas. The Haida Nation will co-manage the area with Parks Canada as they have been doing successfully since the creation off Gwaii Haanas National Park Reserve and Haida Heritage Site. It is the first marine conservation area to become part of the Parks Canada system and is the first step in what we need to do as a nation to protect the marine resource. We congratulate the efforts of all involved, including the Government of Canada, for taking this important first step. We hope the march towards full ecosystem on the entire BC coast continues. If you're interested in visiting the newly established Gwaii Haanas National Marine Conservation Area Reserve, check out our Gwaii Haanas Aboard the Ocean Light II page for the details (and photos) of our adventure tour to this globally unique destination. We have just completed a spectacular month of grizzly bear viewing in the Khutzeymateen Grizzly Sanctuary. The Ocean Light II was based in the Khutzeymateen Inlet from May 14 to June 14 and what an incredible time we had! Spring came early to the north coast this year, the sedge grasses were green and lush when we first sailed into the valley and the wildflowers bloomed much earlier than usual. And the bears were out in all their glory. All of our guests were rewarded with wonderful bear viewing opportunities and experienced thrilling and fascinating bear encounters. The Khutzeymateen seems to create its own weather systems so while much of the coast was getting cold rainy weather we were experiencing beautiful days and very little rain. We watched bears swim, eat, travel, wrestle, sleep, mate, dig, relax and just be. Each day offered a unique look into the lives of the bears and our guests went home with a new understanding of the majestic grizzly bear. The bears of the Khutzeymateen are truly blessed but other bears on our coast are not so lucky. The trophy hunt of grizzly bears is still taking place in BC and we need to help make it a thing of the past. We urge you to write letters to government, sign petitions and join the 78% of British Columbians who want the trophy hunt to end. Letters from foreigners are very powerful too, so let your voice be heard. Visit this page on the Pacific Wild website learn more about the bear trophy hunt and to find out how to make your voice heard in opposing the hunt. Please visit our Grizzlies of the Khutzeymateen trip page for more information about this very popular and unique bear-viewing experience! 19 May 2010 - Oil Tankers in Kitimat? The pristine and ecologically sensitive Great Bear Rainforest faces many threats, including unsustainable logging practices and decimation of the critical wild salmon stocks. Most of these threats to the Great Bear Rainforest have developed over time and, while very serious, many are fighting to solve these problems. But a new and potentially devastating threat has "popped up" on the northern coast. Enbridge, a large oil company, has proposed the Enbridge Northern Gateway Pipeline which would carry oil from the tar sands of Alberta to a port at Kitimat, BC. Supertankers fed by the pipeline would then travel the very same waters that claimed the Queen of the North ferry back in 2006 (and if human error can sink a ferry filled with humans, we know the same can easily happen with an oil tanker!). A large oil spill in the Inside Passage would have nothing less than an ecologically disasterous and immediately tragic effect. The Coastal First Nations, as well as the leading environmental organizations in the region (Pacific Wild and Raincoast), are absolutely against the plan to allow oil tankers in BC waters. And so is Ocean Light II Adventures. Please help us prevent the northern coast from becoming the next Gulf of Mexico style tragedy through supporting the First Nations campaign to stop the project. You can support their campaign by sending a message to Enbridge's CEO. Thank you. For additional current information on this pending disaster, please visit the websites of Pacific Wild or Raincoast.